The Brummel pendant light by Tech Lighting features a sophisticated mid-century modern design with its clean sharp lines defining its spun metal shade. 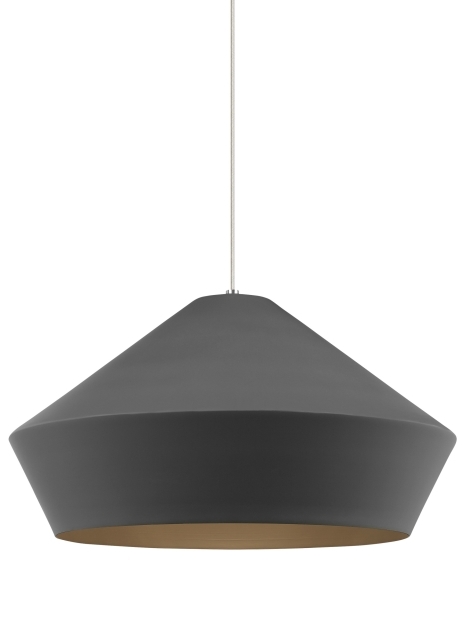 Available in either a Matte White or Matte Charcoal and three on-trend finishes, the Brummel pendant is customizable to fit your special space. Scaling at 20” in length and 10.7” in diameter, the Brummel is ideal for dining room lighting, home office lighting and family room lighting. Your choice of fully dimmable halogen or LED lamping ships with the Brummel, saving you both time and money. Pair the Brummel pendant with the Monorail system by Tech Lighting for greater design customization in your special space. Rated for (1) 60 watt max E26 medium base lamp (Lamp Not Included). LED version includes 19 watt, 1680 delivered lumen, 2700K, medium base LED A21 lamp. Fixture provided with six feet of field-cuttable clear stream cable. Dimmable with most LED compatible ELV and TRIAC dimmers.